Mr. Atofarati was admitted to the Nigeria Bar in July, 2006 with 2nd Class (Upper Division), Mr. Atofarati has worked with the Law Firm of Abdulrahaman Olodo & Co of Ajegunle Street , Osogbo Osun State. He has also lectured in Osun State Polytechnic as a corp member in 2006. 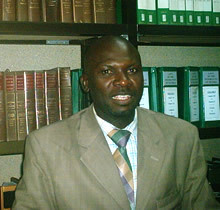 He has been exposed to general practice of law since he joined the Law Firm of Yusuf O. Ali &Co in September, 2007.